Heat oven to 375°F. In large bowl, stir cookie mix, butter and egg until dough forms. Scoop dough by rounded tablespoon into 24 pieces; roll each into a ball. Place 3 inches apart onto ungreased cookie sheets. Bake 9 to 11 minutes or until edges are light golden brown. Cool 1 minute; remove from cookie sheets. Cool completely. Measure 1/3 cup frosting into each of 2 small microwavable bowls. Stir red food color into 1 bowl; stir blue food color into other bowl. Set aside. Line two cookie sheets with wax paper. Place remaining 1 cup frosting into another small microwavable bowl; microwave uncovered on High 30 seconds. 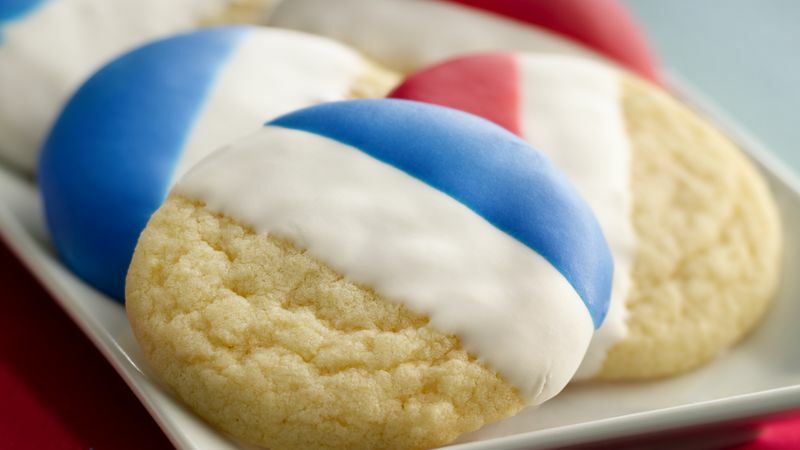 Dip each cookie halfway into white frosting, allowing excess to drip off. Place on wax paper; let stand 20 minutes to set. Microwave bowls of red and blue frosting uncovered on High 30 seconds. Dip white-frosted side of each cookie part way into red or blue frosting, leaving some of the white showing. Allow excess frosting to drip off. Place on wax paper; let stand 30 minutes to set. Store in single layer, loosely covered at room temperature. Color the frostings to match your favorite team colors.